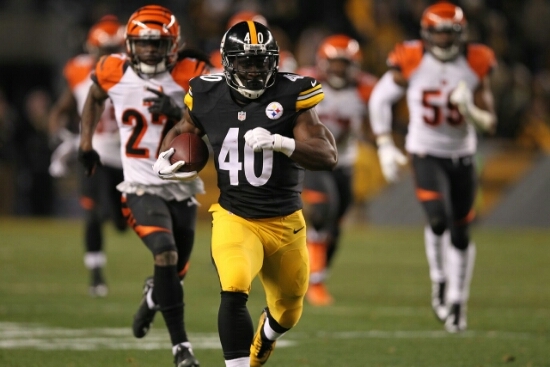 Steelers RB Harris Hoping to Secure Roster Spot | "IT'S A STEELERS WORLD"! Pittsburgh Steelers running back, Josh Harris hopes to move another step closer to securing a roster spot during the Steelers Week 1 preseason matchup this Friday against the Jacksonville Jaguars. ”I’m just trying to show that I can be the guy,” Harris said. ”If you need me to play here or there, I want them to know that I’m the guy that can do it. I just want to make sure the team has total confidence in me”. Harris, who was an undrafted free agent proved his worth last year during the Steelers regular season finale against Cincinnati. With the AFC North title on the line, the rookie was pressed into action when Le’Veon Bell went down with a knee injury due to a legal but personally “dirty” hit. Harris showed his rushing capabilities by busting off a 59 yard run that was called back because of a holding penalty. That’s OK with Harris, who is looking for more this season. ”I don’t want it to be that ‘He just did it once,”’ Harris said. ”I want to do it a lot more because if you only do something once, they might think it may have been a fluke. If you do it a lot, it becomes who you are, and I want to be known as the guy who can hit the hole and go all the way”. He’s competing for a spot behind Bell and veteran DeAngelo Williams, who signed a two year deal with the Steelers in March. Harris displayed that quick burst again during a training camp practice this week, rushing through a large hole along the right side and deep into the secondary. ”It’s just the fact that I played a few times last year,” Harris said. ”That’s in my mind and I can always fall back on that”. ”It’s night and day and you can kind of tell he’s getting more comfortable,” Bell said. ”A lot of people look at him as a bigger guy, but he’s extremely fast. He’s a guy who can break it in the open field and make plays happen”. Harris, after his moment against Cincinnati, got the call in the wild card game against Baltimore when Bell missed with a knee injury. Harris made the start and led the Steelers with nine carries and 25 yards. That taste of action motivated Harris enough to work out in Florida with teammate and All Pro wide receiver Antonio Brown during the off season. ”He works hard,” Harris said. ”It helped a lot because you can play at a higher level if you’re in shape”. An obtainable goal for the second year back. And I believe a goal he may just accomplish.